On the second day we woke feeling a bit tired but no aches or pains. We met Graham for breakfast at the hotel at 8:30am. Graham had been cycling all over France for the past two weeks and had cycled up from Boulogne the previous day. We consumed as much hotel breakfast as we could and checked out of the hotel. The weather was drizzly and windy. It was a moderate to strong wind coming from the North and our course was heading roughly North-East. 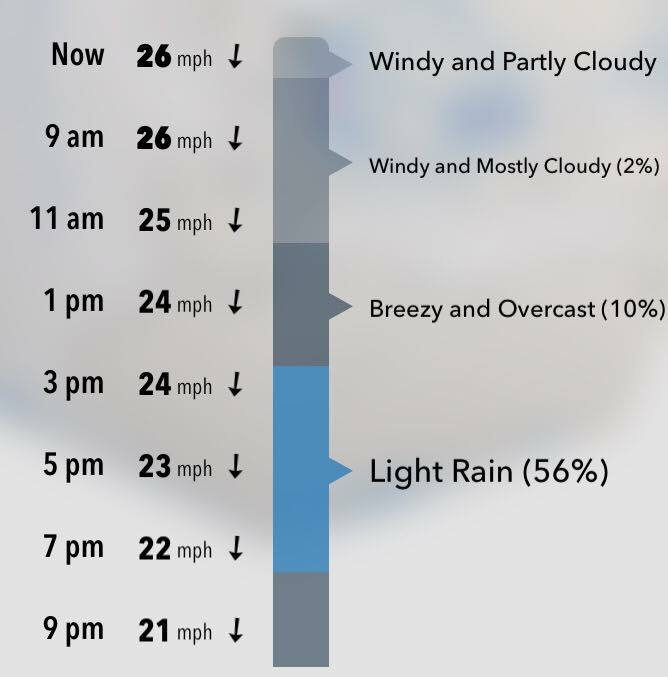 This wasn’t at all ideal as we spent pretty much the whole day battling the headwind. Riding in the rain isn’t too bad, but a strong headwind is hard work. The landscape we were cycling through was very exposed and, whilst it was flat, it honestly felt like we were cycling up hill all day. Progress was slow but we kept on pushing without taking many breaks until we found somewhere to stop for lunch. After lunch the planned route was to take us along the sea front, but that was so windy it was comical. We shielded our eyes whilst cycling trying to prevent the sand flying in. After cycling along the sea front for a kilometre we aborted and headed in-land for less wind. This worked well and we cycled along a road well-provisioned with a dedicated cycle path which ran parallel to the coast. 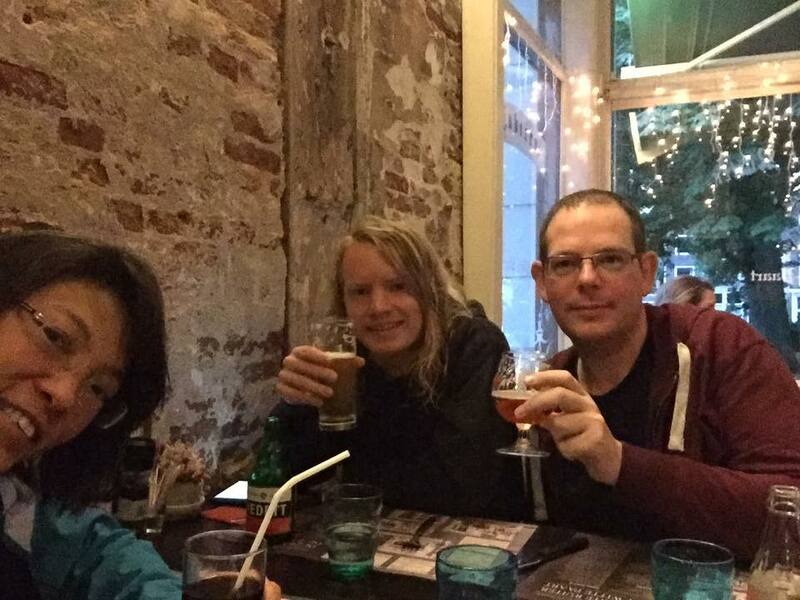 The original plan had been to hook up with Jack and Chris in Bruges, but due to passport issues they had to cancel the trip. We were a bit behind schedule so took a decision to just touch the outskirts of Bruges rather than going right into the city centre to save a bit of time. On a nice day with no wind the route would have been nice I’m sure, but on this particular day it felt a little bleak and our only option was to keep on pedalling into the wind. 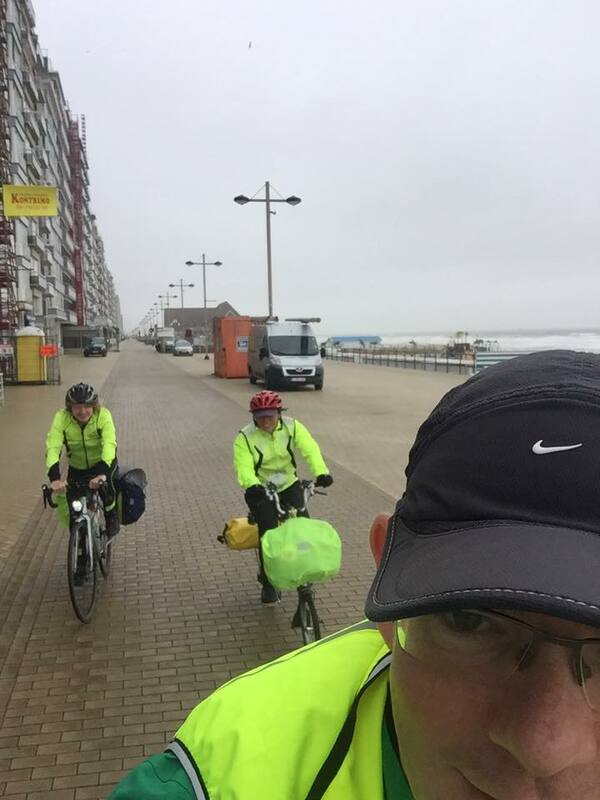 Our route was to take us on a bike and foot passenger ferry from Breskens to Vlissingen. 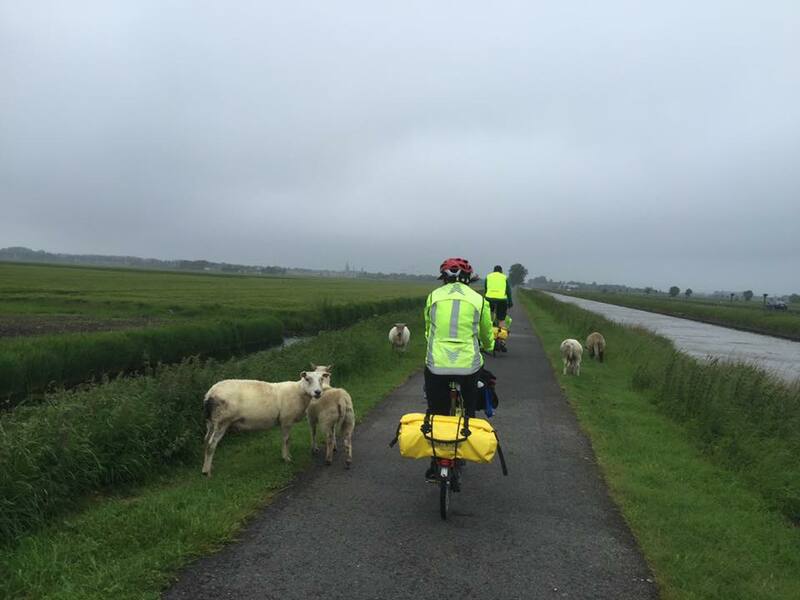 We checked the crossing times and made another impromptu change to the route – again, we took an inland option rather than cycling along the coast. We made the ferry in good time. The ferry was very efficient, and the ferry terminal was designed for people to easily negotiate the terminal on-bike. There weren’t many other passengers on board – presumably it gets busy during rush hours or at the weekend. When we disembarked at Vlissingen we had an easy 6 mile ride to Middelburg – our stop for the night. Middelburg town centre is very picturesque. Our hotel was fairly central. When we arrived, one of the hotel owners was at the door looking out for us. We had an incredibly warm welcome and were shown to our incredibly comfortable rooms. As we were all exhausted we quickly got ready to head out for the nearest eatery. Luckily for us the nearest eatery had an excellent choice of food and beers and the best chips I’ve every tasted, served with mayonnaise. Again, getting to sleep would be no problem. In terms of bike for a Netherlands trip, I think gearing-wise just use whatever you’d use normally, e.g. probably 50T, but if you like high-cadence get 44T, or low cadence get 54T. A Bromtpon rack is handy. It adds a bit of weight to the bike, but allows you to easily carry e.g. an Ortlieb rack pack in this case. The front T bag is also pretty useful and I don’t ride anywhere without it. Some people tour with S handlebars, but I prefer the M type as the riding position is more upright. Dynamo hub lighting is a big investment, but means you don’t really have to think about lighting again. Good luck, feel free to ask more questions, and let us know how it goes! Happy cycling.